Director Ringo Lam returns to his roots of his 1987 cult classic City of Fire, with this non sequel mash up of the best and and wild mayhem of action adventure films of that time. Working from his own script, the beginning of the story seems a bit confusing as it establishes the characters. The sights and sounds of the busy crowded streets of an unnamed Chinese city adds to the feeling of that non stop thrill ride. If you can muck out the first half of the movie, then you will be rewarded to car chases, shootouts, Parkour over tall apartment buildings, and so much breaking glass that is so outrageous it's almost a drinking game. 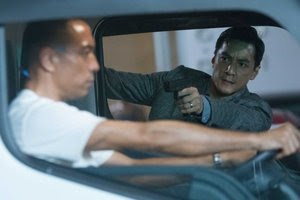 Daniel Wu is the main character Chong Tin-Po who works as a security chief of Sky One, a high tech research facility trying to cure cancer. Tin-po's wife had passed from the disease and he feels compelled to work with Gao Yu (Zhang Jingchu), the main researcher. She is unfortunately married to the executive of Sky One, Tong Wing-cheung (Fan Guangyao) who only see's the material rewards that come from ex-stem cell cure. He and his wife had once worked together with their professor and mentor who mysteriously died in a laboratory fire and his notebook stolen. The late professor's son Yinwan (Zhang Ruoyun) and ex-army mechanic (Joseph Chang) with the sick adopted sister (Amber Kuo) get all mixed up in this thing by trying to steal the ex-stem cells. Tin-po tries to track down the stolen truck, but Tong sends his own mercenaries out too, and they don't have any qualms about leaving a body count behind. It probably really doesn't matter why the ex-stem cells were stolen, and why Tong wants to eliminate everyone associated with his old professor including his long suffering spouse. There are quiet moments of reflections by everyone on their past that have brought them to this moment in time. It's the crazy, tense, excitement that fills that last act of the film that makes it worth it all. So it doesn't make a whole lot of sense, and the special effects are not quite spectacular, it's just a nostalgic nod to the heyday of John Woo.